Important recent research accomplishments by NGI researchers, in collaboration with NOAA researchers, focus on the issues and resources of the Gulf with many of the tools and protocols transferrable to other coastal environs. Listed below are several examples of these successes with additional details available in the later project descriptions. Analysis by FSU researchers of the stepped-frequency microwave radiometers (SFMR) wind-induced emissivity measurements collocated with dropsondes identified two distinct wind speed regimes for which the distribution was statistically different. It was found that the 10 to 20 m/s SFMR wind-induced emissivity measurements had a low bias compared to the modeled wind-induced emissivity, but no apparent storm relative azimuthal asymmetry. For the 20 m/s or greater SFMR wind-induced emissivity measurements, there was a storm relative azimuthal asymmetry identified. Research continues to produce fields of surface turbulent air-sea fluxes and the flux related variables (winds, SST, near surface air temperature, near surface humidity, and surface pressure) for use in global climate studies. The FSU winds (monthly averages of gridded winds over the tropical oceans) were produced and made available to a wide range of users such as ENSO and fisheries forecasters. The NOAA Office of Dissemination is evaluating the use and applications of NOAA Weather Radio All Hazards to determine user requirements to transform the current NOAA Weather Radio All Hazards broadcast network into a new integrated weather information distribution/dissemination system. The project team at the University of Alabama are currently conducting case studies of actual events to study modalities. Analyses of profiler and radar data continued to document the variability in low-level clouds, thermodynamics, and wind (wind shear) for cold-season tornado events. Ceilometer data were examined to determine cloud base height distributions and cloud cover fraction around tornadic storms (supercell vs. QLCS) to address the hypothesis that cloud fraction (cloud base height) tends to be high (low) for tornadoes in the Southeast. Activities of the U.S. Research Vessel Surface Meteorology Data Assembly Center (DAC) at the Florida State University (FSU) included continued implementation of the Shipboard Automated Meteorological and Oceanographic System (SAMOS) initiative (http://samos.coaps.fsu.edu/). The SAMOS initiative is focused on improving the quality of and access to surface marine meteorological and oceanographic data collected in situ by automated instrumentation on research vessels. During the reporting period (10/1/16-6/30/17), 28 research vessels routinely transmitted daily emails containing one-minute averaged meteorology and surface oceanographic data to the DAC. This project ensures that the highest quality marine meteorological and near surface oceanographic data are collected by research vessels, primarily from the U.S. fleet, and that they are distributed and archived in a manner that makes the data accessible and useful to a diverse research and operational user community. Additional assessment of data from the National Buoy Data Center (NDBC) provided validation and case study analyses of NOAA experimental HWRF products such as HWRF-HYCOM, HEDAS, and basin-scale HWRF. Tropical cyclone-tornado research from a previously funded AOML grant provided leverage in the validation and analyses. An Interactive Sea Level Model (GeoCoast) has been developed. Lidar data collected in 2015 for the 3 coastal counties of Mississippi were used to develop a 10-ft resolution DEM (digital earth model) as a base for assessing the impact of sea level rise on the road network. A road centerline dataset, developed in an earlier MDEM (Mississippi Digital Earth Model) award, was merged with the elevation raster cells to transfer elevation measures to segments of the road centerline dataset. A web-based GIS (GeoDawg) has been developed with the general public in mind. Popular spatial datasets (e.g., census of population, economics) may be accessed with a collection of commonly used GIS tools. Research on the endangered smalltooth sawfish continued and provided new insights into their mating grounds. During the reporting period, 12 large juveniles and adults of the endangered smalltooth sawfish were captured and tagged. This is the first time researchers have captured adult males and females together in the three different regions, during the same season. Interestingly, all three adults captured in Coot Bay showed very fresh signs of mating, with wounds and scars from rostral teeth on the dorsal and ventral surfaces. This is the first time that mating grounds have been verified. In addition to numerous news reports, the findings will also be included in Shark Week 2017. Research continued with expanded water quality sampling in tributaries and estuaries in the Northern Gulf of Mexico. This research is creating a baseline trace element and strontium isotope map of primarily the Pearl River and also a few of the rivers draining into Lake Pontchartrain. This map will be used to better understand habitat use of Gulf sturgeon in the system and will be used in conjunction with data previously collected in the Alabama and Florida panhandle in the eastern NGOM. An evaluation of the applicability of using UAS for oil spill detection in the Gulf of Mexico is currently underway. The focus of this task is to use an ultraviolet light source to "excite" hydrocarbons associated with oil deposits on the sea surface. A proceeding report from the 6th Annual Hypoxia Research Coordination Workshop was completed, identifying the partners and mechanisms necessary to implement and sustain a Cooperative Hypoxic Zone Monitoring Program. The complete report is available at www.ncddc.noaa.gov. An ongoing project with the objective to provide a range of realistic scenarios of future environmental changes in the northern GoM (including the shelf region) for the research community and fisheries resource managers continues to develop the regional ocean model (GOM8). GOM8 reproduces reasonably well main circulation and hydrographic patterns, such as the Loop Current, mesoscale eddies, hypoxic region over Texas and Louisiana shelves, SST, and surface chlorophyll for a comparison between model and satellite chlorophyll). Modeling of small and large plankton components allows a better representation of ecological processes in the coastal and oceanic domain. Seasonal variability of phytoplankton biomass shows significant regional differences across the northern GoM. The next phase of this project will be to obtain future projections over the 21st century of physical & biogeochemical processes in the northern GoM under a high and a medium-to-low CO2 emission scenarios, using the model configured from task 1 and projected atmospheric fields from the Coupled Model Intercomparison Project phase-5 (CMIP5). The analysis of the Biscayne Bay water quality data indicated that following a significant bloom of a picophytoplankton (Synechococcus) in September of 2005, the oligotrophic system had shifted to a more phytoplankton dominated system than the benthic/submerged aquatic vegetation system that dominated prior to the 2005 bloom. Results of this analysis (with others ongoing) are being used to develop process studies for additional data collection that will be incorporated into a coupled hydrodynamic model for ecological assessments that will be used to inform watershed management and habitat restoration decisions. Calibration and validation of ocean products on NOAA VIIRS for monitoring oceans continued with several outcomes. As a result, new ocean products have been developed from the VIIRS orbital overlap and have been validated. Measurements of diurnal changes in ocean color in turbid coastal regions in the Gulf of Mexico were characterized using above water spectral radiometry. Protocols were developed for collection and processing of in situ optical data used for ocean color calibration and validation. These included the IOP floating hyperpro and above water ASD instruments. Results of protocols and all data from the ocean color cruises were transitioned to NOAA and put into cruise reports. The WavCIS platform is transitioning daily data to NASA and NOAA for calibration and validation of the Ocean Color on VIIRS satellite. These data are being used for maintaining high quality VIIRS products. 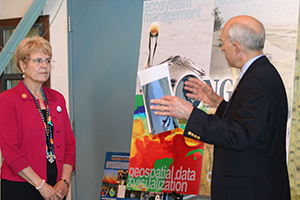 An enduring mapping center to address research and development needs that advance the science and practice of hydrography and cartography has been established at the University of Southern Mississippi. The research plan encompasses five thrusts (e.g. Sensors/Platforms, Positioning, Water Levels, Data Management, Data Portrayal). An initial effort included the use of Lidar data for several significant sections of the Northern Gulf Cast for comparison to shorelines depicted on existing charts. The Continuation of Comparative Metagenomics to Indicate Sites Under Anthropogenic Pressure project has greatly reduced a backlog of previously acquired data sets. Bioinformatic analysis of several new projects to serve core missions of NOAA was initiated. Preparations were initiated to embark on field operations to test the viability of 1) environmental sample processors on AUVs to match the sampling fidelity of shipboard sampling, 2) larval community metabarcoding to match the fidelity of manual counting, and 3) free environmental DNA as a proxy for recent fish population counts.